Government programs such as Medicare, Medicaid and the Veterans Administration will cover the cost of long-term care under certain conditions. 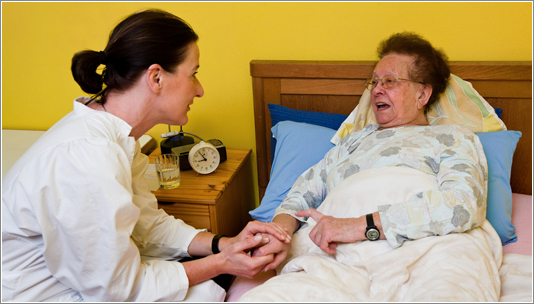 Medicare will cover rehabilitation from a hospital stay or limited care at home if there is a skilled need. The Veterans Administration will cover the cost of nursing home care if the veteran is at least 70% service-connected disabled. The VA will also cover other forms of home-based or community-based care if there is a medical need. Medicaid will cover both medical and non-medical related long-term care but in order to qualify for Medicaid a person has to have less than $2,000 in assets in most states and income that is insufficient to pay the cost of care. In other words a person must be impoverished. Otherwise Medicaid will not pay. Government literature and government websites claim that state and federal governments pay a large proportion of long term care costs in this country. That is only true because the majority of long-term care services are provided free of cost. In order to understand the private versus government burden for long-term care we need to look at the actual hours of care provided and not the cost. Based on our analysis of yearly, one-on-one care hours, we estimate that about 84% of all long-term care is not covered by government programs. Conversely, this means only 16% of long term care service hours are covered by the government. The 84% that is not covered is primarily family-provided home care to help with activities of daily living, or help with maintaining a home, providing meals and support, or care services providing supervision or companionship or providing transportation and shopping services. Care costs not covered by the government are also care provided from family out-of-pocket payments in nursing homes and assisted living facilities. Families are also hiring more and more private services to help with care at home. 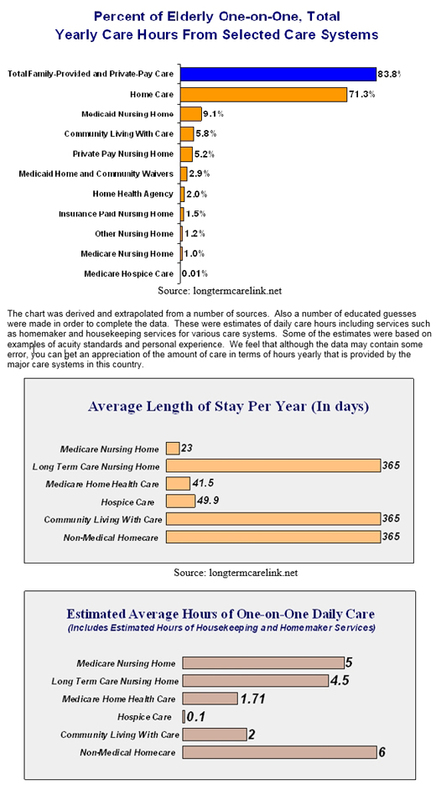 Based on the charts below about 71% of all long-term care hours are provided in the home by family. (We have excluded home care hours from Medicaid and Medicare programs). Most of this care is provided free of charge by family members, friends or volunteers. However some is provided by professionals or aides paid from family funds or from insurance. Some care is also paid for privately for assisted living and nursing homes as well. If we were to multiply the total number of care hours we derived for the chart below times the average hourly cost for what private aides would provide, we would have a rough equivalent yearly cost of family-provided and family-funded care in this country. We estimate about 16,556,400,000 hours per year of care hours in 2000 (it is difficult to find current figures). The number of elderly has grown about 1% per year since then. This gives us roughly 19,221,000 hours currently. We use a cost of private health aides at $25 an hour. Multiplying the two figures together gives us about $480.5 billion of equivalent, current family-provided care cost. This is roughly 3 times the total current amount the state and federal government pay yearly for all long-term care services. If the Federal government alone had to pay all home care costs in this country combined with what it already pays for long-term care, the cost would be the third largest single expenditure in the federal budget exceeded only by Social Security and defense. Many people are pushing the government to do just that – pay an increasing amount of home care services for the elderly.